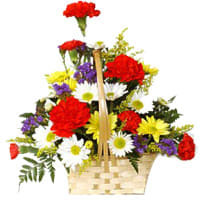 Feel great when you gift this Enchanted Arrangement of Mixed Carnations and Gerberas and bring joy into the lives of the people you love. Mix Arrangement of Carnations and Gerberas with 500 grms Assorted Sweets. Mix Arrangement of Carnations and Gerberas with 15 pcs Ferrero Rocher chocolate box.